caving | I'd rather be diving..
A mine dive in deepest darkest Derbyshire..
“Hello Boy !” greeted me as the door opened and my hand is squeezed to the point of pain. This is the usual greeting I receive when visiting Martyn Farr at FarrWorld, the home of one of cave diving’s best known and experienced proponents. It seems like a long time since I first met Martyn, over 3 years now, but he doesn’t really change, still vertically challenged, still as fit as the proverbial butchers dog and still a fascinating and bewitching orator. 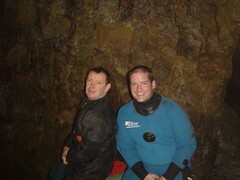 I first attended his Cavern Course and then progressed through Intro Cave and Full Cave until I was a qualified cave diver… what a scary thought that was.